When should you outsource marketing? 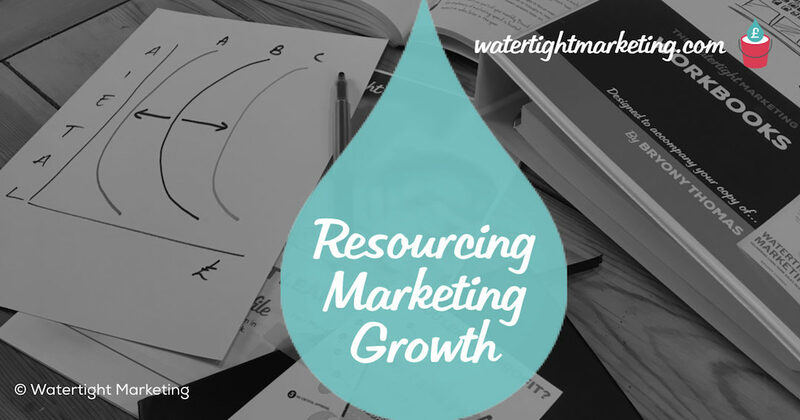 When should we outsource marketing? One of the things that often seems to present problems for businesses – whatever their size – is resourcing. In larger organisations this manifests itself as questions around objectives, roles and responsibilities, structure and capabilities. In smaller organisations the thinking is more around how to resource a plan and in particular the interplay between time, money and knowledge. There is another dimension to this model and it is Now versus Future. So, you might not have time or knowledge or money at the moment, but in order to resource things in the future, you might want to gain one, or more, of them. The more you have of all three factors – time, money, knowledge – the more choice you have. 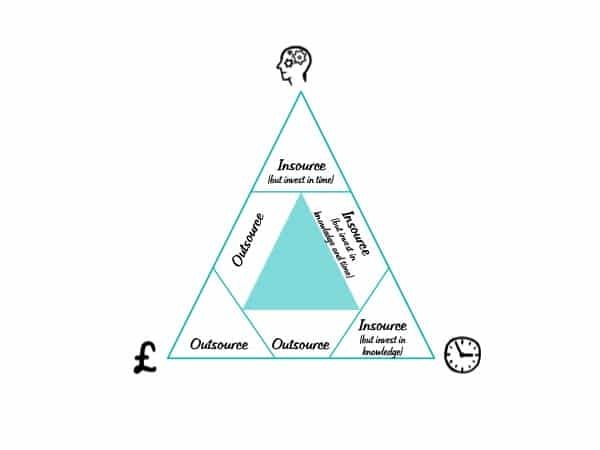 Conversely of course, the less you have of all three (the middle shaded triangle), the more you need to decide either to do it yourself or make some kind of investment in time, money and/or knowledge. 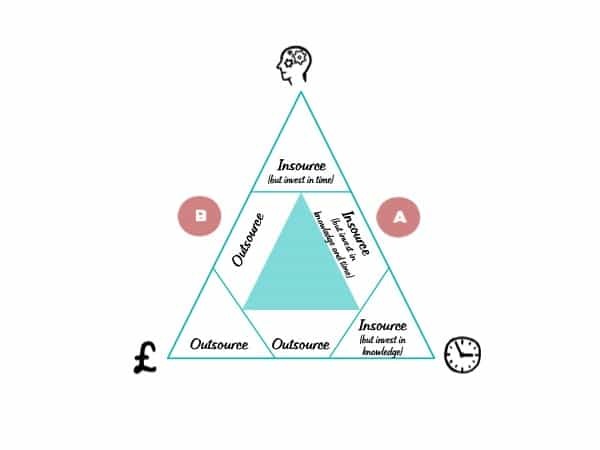 Top and right in the triangle there is a tendency to insource, though you might need to outsource first to (a) gain knowledge before you can then bring it in-house again, or (b) to give you time to gain money to either outsource permanently or recruit and bring the role in-house. Bottom and left in the triangle there is a tendency to outsource, though at some stage you may decide to employ someone part- or full-time to undertake that task. Let’s take two different situations so you can see how the model can help you decide. These are both based on real scenarios in real businesses. Suppose you have a marketing plan but you now need to action it. Imagine that you decide you don’t have sufficient knowledge, at least in certain areas, but you don’t have much money. This puts you at point A on the model. Whether to invest some money to at least get you set up and making progress, even if you subsequently bring those tasks back in-house. If you are genuinely committed to taking action, and you really can’t do number 2, then you have to do number 1 (or vice versa). There is always the third option of not doing anything, but if you have already got this far and decided to grow the business in some way and have developed a business and marketing plan to effect this, you’re probably reluctant to take the route of doing nothing. The second scenario is where you don’t have the time or the knowledge, but you have some money you could use to outsource a particular task or project (point B), even if it’s only for a while to move things forward. Longer term, you can do one of three things. You can decide to employ someone, even if part-time, to do this job for you. But for now, you feel that you can progress things faster and more effectively if you outsource this piece of work. Once that decision has been taken, then you need to develop a brief, find the right supplier and get on with it. The time-knowledge-money thinking also helps you work out how to resource your business in the future. Do you want to develop your knowledge so that you can do more in-house? And, if this is true, then what does this say about your time; do you need to relinquish some things to take on a new role? One client we’re working with is a founder and managing director whose job is currently focused around sales. For several years he has felt he is the best person to go out and sell his particular product but as the business is growing, he needs to spend more time providing direction and leadership as the MD. He has all three – money, time and knowledge (though he does recognise that he needs to develop his leadership skills). His decision for the future is whether to recruit someone who he can trust and to whom he can transfer his current sales role or whether to delegate it to someone already within the company. These are both forms of insourcing, but one will cost more so will depend on whether he wants to make that extra investment of money. Lucky you! If you’re in this position, then you’ll have the luxury of choice about whether to do it yourself in-house or outsource. The factors driving this decision will therefore be more around whether you feel you have sufficient knowledge or time or money to get the job done to the level and quality that you want it done. Sometimes, it can be useful to use external resources for a while. It helps alleviate immediate workload issues and it will develop your team’s knowledge which you can then transfer in-house. Or, it helps buy you time so you can think about what resource you do need, whilst still progressing things. Hopefully, your investment in any of these won’t be so great as to be a deal-breaker. If you can invest enough you are much more likely to get to the next stage faster and more effectively than if you went down the DIY route.